The one thing I miss in Mumbai are the tiffins in Bengaluru. I was smitten by the dosas in CTR and MTR and Sri Krishna Kaf'e there and the idlis in Veena Store. They had spoiled me for all dosas and idlis in Mumbai. Life's taken a full circle in a way. Bangalore is the first city that I had visited when I was a market research trainee. I couldn't get enough of ham, sausages and bacon in the hotel breakfast then. My hairline has receded since then and my side whiskers have greyed. When I go back to Bengaluru now I ditch the hotel breakfast and head to the local South Indian joints for the vegetarian tiffins and filter kaapi. 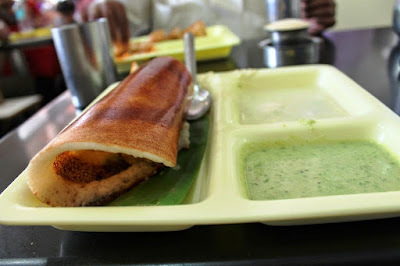 Read about my favourite Bengaluru breakfast stops in my post in EazyDiner.